Perennial and evergreen, this is an easy-care house plant. It adds a lot of personality to a room for little effort. Constantly wet soil is needed to keep Juncus effusus 'Spiralis' healthy and thriving. Water generously. Don't allow the soil to dry out. Foliage will turn yellow then brown if it gets too dry. 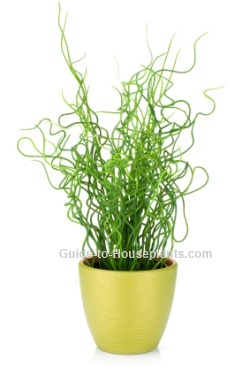 It's a good idea to keep your corkscrew rush plant in a pot without a drainage hole. Juncus is native to marsh areas, so it loves soggy soil -- even standing water. Shed some light. Put your Juncus plant in your sunniest window -- or shift it outdoors for the spring and summer. It will tolerate lower light levels, but won't grow much. If you don't have a spot near a window, grow lights work beautifully. Repot in spring, moving up to a container 1 size larger when it becomes crowded. Juncus is fast-growing when it gets the sunlight and water it wants. You may need to divide it every spring. Need an indoor watering can? Pretty and practical... functional and fun...you'll find a watering vessel here to suit you and your house plants.